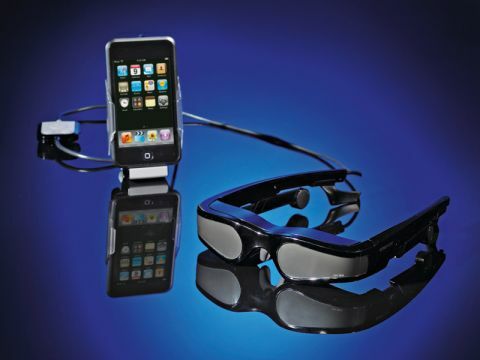 The Carl Zeiss Cinemizer displays a 640x480 resolution and works with an iPod dock and a range of sliding trays to cradle your iPod or iPhone and lock it into a Universal Dock Connector. The power button is small, fiddly and off to one side, and the earpieces slide out under the bars that go over your ears to rest on, but not in, your ears. A wired remote on the connecting cable gives you basic volume and browsing controls. Next to the twin viewfinders are focusing wheels that adjust for near- and far-sighted wearers. Image quality is acceptable, but contrast levels need some sharpening. Sound is a weaker point. Without the preferable in-ear cup, you’ll need to crank the volume to hide engine rumble on aeroplanes. The Cinemizer is not built to work with the iPhone, but it will. When you dock an iPhone, Apple’s über-gadget tells you the two aren’t compatible. Ignore and proceed. Go into your iPhone’s Settings and select Airplane mode to turn off network interference, then you’re off! The Cinemizer will display any video the iPod can display, so on an iPhone or iPod touch that means any web content they would normally recognise, and iTunes content, too. We watched YouTube content and shows we had recorded from TV and exported to our iPod. David Attenborough’s Life in the Freezer played back well. The goggles have a 3D mode that cleverly splices and rejoins specially produced 3D content. We observed this working well, but this type of content is rare and, we suspect, offers niche appeal. The image covers your central, but not peripheral vision. You can still see daylight above and below the goggles, so a visor would be helpful. Borg fears aside, we like these. They will appeal to people who like watching video alone, and they offer great build quality. UK pricing and distribution will be announced soon.